I am curating a Maps Only show in May/June of 2012 in San Francisco, California. It will “Really” show Maps Only and include many U.S., Local and European Artists renditions of Maps Only. Some of what will be shown is a secret, except to the artists participating and though I am curating the show and showing a large mosaic map myself, “some of it” is still a secret from myself. What is for sure, is that opening night Big E’s will be taking care of the organic drinks and food, Cyrus will roaming the gallery and Valencia Street with his camera and all of the Maps will be interesting, for sale/trade or in some way available to the public. I will write more about Maps Only as it becomes less a secret from myself. Tagged with 2012, art, artists, curate, European, Local, maps, mosaic, public, sale, trade, U.S. 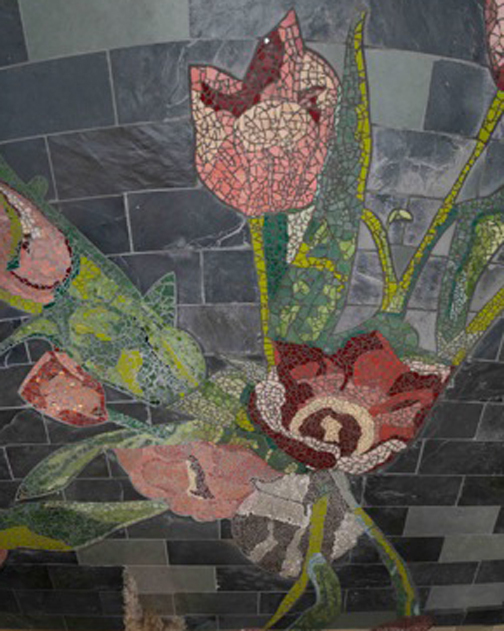 The Artists are Matt Crestetto-Tile Setter; he cut the tile around the tulips. I love working with him. He’s a fabulous Graffiti Artist and now traveling to legal places to make his Art. Sarah Dorrance-Design/Mosaic: she loves the Earth and is frequently found trying to bring the outdoors inside. I took this tulip Polaroid about 10 years ago and have always wanted to build it. Here it is. The pieces are small, all hand snipped and glued down by me. A question that always enters my mind as I am building is “why”? Why so small, so heavy, so manual, so hard? These questions are for another time and for the rest of my life.